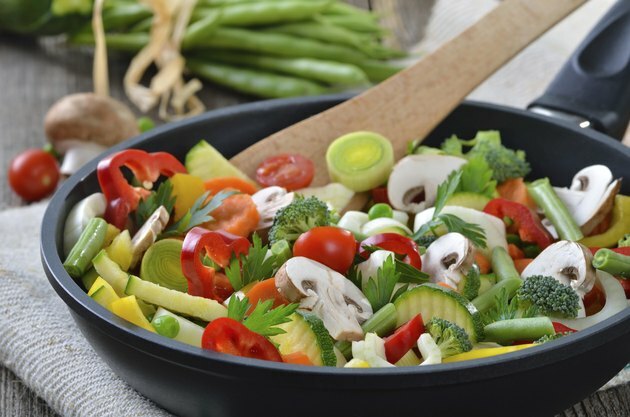 Use a heavy skillet to prepare vegetables using a variety of easy cooking methods. Sauteeing is a quick-cooking method that retains the quality and flavor of nearly any vegetable. Braising is a slow-cooking method that softens and tenderizes chunky vegetables such as parsnips, winter squash, peppers, cabbage, leeks, carrots or beets. Panning is a relatively fast cooking method that works well for leafy greens such as spinach or chard, or for chopped or shredded vegetables such as cabbage, summer squash or carrots. Panning steams and tenderizes the vegetables in their own juices. Place a small amount of oil in a heavy skillet, using just enough oil to cover the bottom of the pan. Use butter, or choose healthy oils such as olive oil, canola oil or soybean oil. Heat the oil until it begins to sizzle. Place the skillet on medium-high heat. Watch carefully, as oil -- especially butter -- burns quickly. Wash, peel or chop your vegetables, then add them to the hot oil. Don't overfill the skillet, as too many vegetables lower the temperature of the oil. Sauteeing the vegetables quickly preserves the flavor, nutrients and color of the vegetables. Stir until the vegetables are evenly coated with oil, then continue to stir occasionally so the vegetables cook evenly. Don't stir constantly, as stirring lowers the temperature of the oil and causes vegetables to become soggy instead of crisp. Remove the pan when the vegetables are slightly tender and crisp, and the color is still vibrant. Heat a small amount of oil, such as canola, olive or soybean, in a skillet. Use just enough oil to cover the bottom of the skillet. Add the prepared vegetables. Cook garlic, leeks or onions first. Allow them to soften for one to two minutes, then add the remaining vegetables. Saute' the vegetables until they are slightly softened. Let the oil cool slightly, then add enough liquid to cover the vegetables no more than halfway up the pan. Use water, or more flavorful liquids such as fruit juice or chicken broth. Put the lid securely on the skillet, then bring the liquid to a boil. Then lower the heat to a gentle simmer. Simmer the vegetables until they are tender when you poke them with a fork and the liquid thickens to a sauce or glaze. Braising time varies depending on the size and type of vegetables, but can take as long as two hours on very low heat. Cover the bottom of a skillet with 1 to 2 tsp. of liquid, such as water or broth. If you like, you can pan vegetables in oil. Place the skillet on a burner set to medium heat. Place chopped or shredded vegetables in the hot liquid or oil. Place the cover securely on the pan. Reduce the heat to low. Remove the lid occasionally to stir the vegetables so they don't stick. Allow the vegetables to steam until they are tender -- about six to eight minutes. Never add cold liquids to hot oil, as the oil may spatter and cause burns. Allow the oil to cool first. Science of Cooking; Ask the Inquisitive Cooks; Anne Gardiner, et al.